iPads are all over the place at Macworld | iWorld, and fingerprints are all over those iPads. Fortunately, there’s no shortage of iPad cleaners in the exhibit hall. Companies such as Zagg and iKlear are selling their cleaning solutions and wipes at discounted prices for show attendees. You can even find microfiber cloths, if you shudder at the thought of spraying your iPad with a liquid. 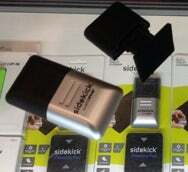 Or you can use the Sidekick, a $20 ($10 at the show) cleaning device that uses a carbon cleaning pad to wipe away fingerprints. When the carbon wears off, you can buy a pack of two replacement pads for $15. The fact that LensPen demoed the Sidekick with Android tablets didn’t seem to deter bargain hunters. Of course, you can always do what I do to clean my screen—wipe it off with my sleeve. It’s almost as effective as any cleaner, and it’s free.